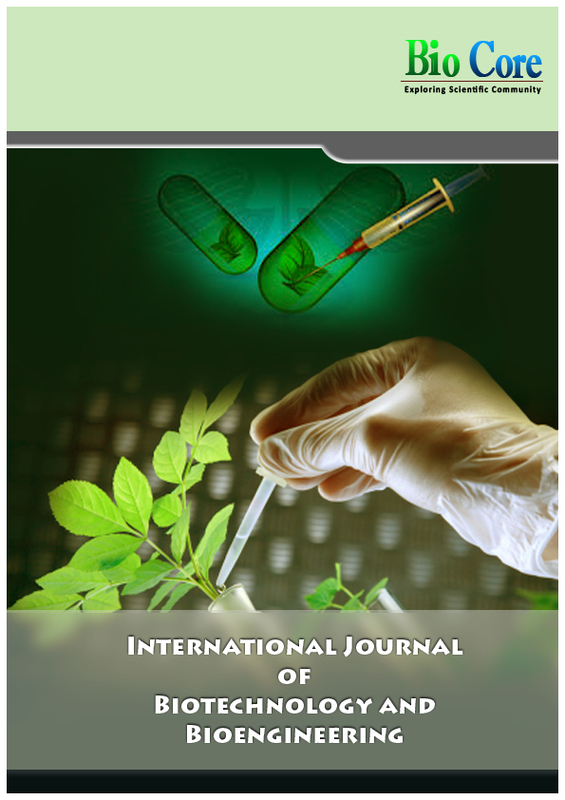 Conflict of Interest: Being a multi-center, international research project, it was necessary to obtain the participation of various authors. This work had no grant or private support. This study was approved by the University of Sao Paulo, ethical committee and all participants signed an informed consent agreement. Precision in anatomical details and the quantification of volume loss is important in bucco-maxillofacial prosthetic reconstruction for the accurate symmetrical rehabilitation of patients with bucco maxillo-facial loss or malformations. The objective of this case study was to determine if a prosthetic eye made by the traditional handmade system, using hydrocolloid impression, had the same size as the natural eye and evaluate the role of 3D scanners in this process. In order to determine if the two eyes had the same size, a 3D scanner was used to measure and compare the volume of the depressions created by theses eyes after hydrocolloid impressions where taken. These depression measurements enabled us to calculate the thickness of the eyes, quantifying the accuracy of the traditional confection method. Materials & methods: The comparison was made, after randomly assigning one patient out of 100, who had ocular prosthesis previously constructed in the traditional way, with the use of hydrocolloid material for the impression of the anophthalmic cavity. Stone models were made from hydrocolloid molds of the surface of the eyelids containing: the natural eye, the prosthetic eye, the eyelid of the empty anophthalmic cavity and the mold of the prosthetic eye alone. Following this, measuring tests using a 3D scanner were made and the results were compared. Results: The surface volume of the empty anophthalmic cavity eyelid was 23% smaller than that of the natural eye; while, with the prosthetic eye in place, it was 8% smaller. This indicated that in order to have a closer appearance to the natural eye and a more natural contour, the prosthetic eye would need to be increased in volume. The volume measurement of the prosthetic eye was made using the 3D scanner and was 2750 mm3. 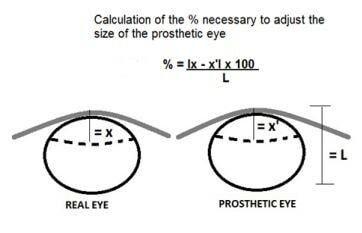 A further measurement, using the computer model, suggested that for the eyelids surface volume to be the same, the prosthetic eye would need to be increased by 2,5 to 5 %, in thickness, depending where the increment was made. Conclusion: These findings suggest that the traditional handmade method of constructing prosthetic eyes, with impressions from hydrocolloid materials, can produce a series of discrepancies during the confection process, and can lead to a significant difference in size from that of the natural eye. 3D scanners could offer a valuable impression method for bucco maxillo-facial reconstruction, as it allows for the delineation of the area of interest to be rebuilt. As mathematical science evolved with new theories[1,2]. It gave other sciences a wider window of opportunity to develop new methods and equipment. The introduction of the “Integral of Lebesque” created the “notion of measurement”, thereby amplifying the classical notion of length, area, volume, etc. This led to the development of the “theory of measurement” and the “theory of measurable functions” 3. As science developed, professionals of all areas searched for new tools to help improve the old techniques. Since then, equipment and techniques have evolved and have been used to measure changes in volume, in various areas of medicine. In dentistry, many volumetric studies have been done to assess changes in gingival contour, tooth, in restorative materials wear, to determine residual adhesive thickness and on teeth after orthodontic bracket removal, etc.[4,5,6,7,8,9,10]. Recently, three dimensional methods, with the use of 3D scanners and printers have allowed the precise measurement of alterations in volume and contour, permitting the achievement of accurate volumetric measurement and reconstruction[11,12,13,14,15] As new technology develops and the cost of equipment fall, old techniques become superseded to give way to better forms of achieving better results. The aim of this case study was to determine if a prosthetic eye (fig. 1), made by the traditional handmade system, using a hydrocolloid material for impression (fig 2), had the same size as the opposing natural eye, thereby, numerically evaluating if a 3D scanner impression could improve the traditional technique for bucco maxillo-facial prosthetic rehabilitation. To achieve this, a 3D scanning method was used to measure and compare the volume of the depressions created by theses eyes after hydrocolloid impressions were taken. These depression measurements enabled us to calculate the thickness of the eyes, quantifying the accuracy of the traditional reconstruction method. From a list of 100 patients, who had ocular prosthesis previously constructed, a patient was randomly selected. This was undertaken, by writing the file numbers of one hundred patients, who had lost and received a prosthesis to replace one eye only and had been attending the ambulatory of the department of bucco maxillo-facial prosthetics of the University of Sao Paulo in the past 3 years for treatment or follow up. The file numbers were placed in a bag and shaken. One of the co-workers removed a number from the bag in order to select the patient to be tested. With the previous approval by the ethics commission of the University and the signed consent of the patient; impressions were taken using an irreversible hydrocolloid material*, during the day clinic of the bucco-maxillofacial prosthetics department, at Universidade de São Paulo (USP ), Sao Paulo, Brazil. The previously constructed, by the traditional method16, ocular resinprosthesis, was placed into the eye socket and an impression of the upper hemi-face, including both eyes was made, with the eyelids closed. The second impression was taken on the side of the anophtamic eye only, also with the eyelid closed, this time without the prosthesis in place and the third impression was taken of the artificial eye, out of the socket.Stone models, made with gypsum**, were prepared and sent to Queen’s University Dental School in Belfast, where measuring tests took place on equipment designed specifically for dental application***. Diagram 1: “surface volume” of the depression made by the molding material on the eyelids, illustrating the how the surface volume was obtained. Diagram 2: “surface volume” of the depression made by the molding material on the eyelids, illustrating the how the surface volume was obtained. 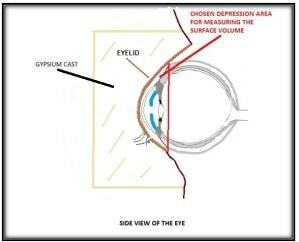 A comparison was made, by measuring the “surface volume” of the depression (diagram 1, 2), made by the molding material on the eyelids of both eyes, using all the cast models obtained. The three-dimensional laser image volume data sets were registered. Recordings were taken to form the final image (fig. 3) and accurate quantification was sent directly to a computer. The individualized scanned cuts were integrated into a navigation system. From the acquired data, a computer model of each studied areas was constructed and measurements were made using appropriate software. A sequence of replicas was superposed and the differences in volume were registered, similarly to previous studies[17, 18]. A further measurement, using computer model was then made to evaluate the discrepancy in sizes. When the models were scanned and saved on the instrument, the contours of the areas to be measured were selected as the “region of interest” (Fig. 4). The data was obtained by requesting “statistics” from the instrument program. The surface volume of the eyelid depression without the prosthesis was 647mm3. The surface volume of the eyelid depression with the prosthesis in place, was 772 mm3. The surface volume of the eyelid depression, with the normal eye, was 841 mm3 and the volume of the artificial eye was 2750 mm3 (fig. 5). The surface volume of the eyelid depression of the natural eye was used as control for comparative reasons. It was noted that, without the prosthesis in place, the volume of the depression of the anophthalmic eye cavity was 23% smaller than that of the natural eye, whereas, with the prosthetic eye in place, it was only 8% smaller. According to the figures, in order to have the same surface volume as the natural eye, the size of the prosthetic eye would need to be increased. When the further measurement using computer model was made to evaluate the discrepancy in size, the result suggested that for the eyelids surface volume to be the same on both eyes, the prosthetic eye would need to be increased, in thickness, by 2,5 to 5 %, (diagram 3) depending where the increment was made. This preliminary work, for this case studied, found that the handmade reconstruction process, using the hydrocolloid impression material, allows for a series of significant discrepancies, leading to an inaccuracy of the final size of the prosthesis, when compared with the natural eye. The accurate knowledge of the real size of the eye to be constructed is valuable, as it helps in the decision of whether to produce a conventional, hollow19 or light weight prosthesis20. A smaller ocular prosthetic volume is important during some phases of use of this rehabilitation device, as it avoids possible side-effects, such as dehiscence of the fornix and lack of mobility that are consequences of heavy and large prosthesis. These considerations are important in ocular prosthesis that is contained in the anophtalmic cavity. If the area of rehabilitation could be previously defined, it would provide a more accurate protocol to be used for the reconstruction. This particular study concentrated on evaluating the conventional technique of fabricating a prosthetic eye, through measurements using a 3D scanner by comparing the discrepancy in size. 3D imaging systems has been previously described in the literature[21,22] to increase the accuracy of measurement in various areas of dentistry, although not widely in use yet, probably due to cost restrictions. Advances in computer imaging have revolutionized medical science[23,25,25,26,27] its use in craniofacial deformities and a more comprehensive diagnosis and treatment plan can thus be obtained by this method, improving the treatment outcome. These findings suggest, in the sample used, that the traditional handmade method of constructing prosthetic eyes, with impressions from hydrocolloid materials, can produce a series of discrepancies during the confection process, and can lead to a significant difference in size from that of the natural eye. The use of the 3D scanners allows for the assessment of very small changes in volume, supplies accurate numerical measurements and permits the demarcation of the area of interest to be rebuilt, making it an ideal auxiliary method for rehabilitation of patients in bucco-maxillofacial prosthetics, where function and aesthetics are essential. They could, additionally, be advantageous for other applications in bucco-maxillofacial prosthetics. These could include the pre and post-surgical assessment and follow up of patients with cranium-facial and lip and palate development malformation and the measurement of the evolution of post-surgical closure of oralnasal cavities in patients with oral cancer. From this analysis we can see its importance in the design and confection of prostheses in patients with eye loss and other reconstructions in buccomaxillofacial prosthetics. The authors would like to acknowledge Dr Cunningham J L CEng CSci FIMMM PhD for his invaluable help with the volumetric measurements.